Soup is the answer to all of life’s most rhetorical and profound problems. Feeling like skinny jeans are just too much for you to handle? Soup. Feeling like you need a stiff drink in anticipation of all of the cooking meltdowns you know you’ll be having in the next four days? Soup with vodka. But for those of us who had to run walk four miles next to Bengay man/woman/other? 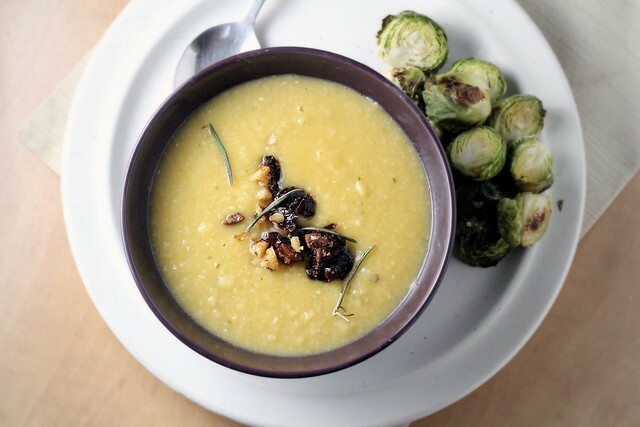 A house smelling like rosemary with a soup that tastes like comfort is totally our answer. There doesn’t even need to be a question. It’s just the answer. Plus we need a way to celebrate the fact that we have completed our nine New York Road Runner races plus our one volunteer session this year. And that we will, by hook or by crook and with a ton of physical therapy sessions, be running the NYC Marathon in 2012. So if this soup were our proverbial cake, that fig and walnut tapenade would be the icing. 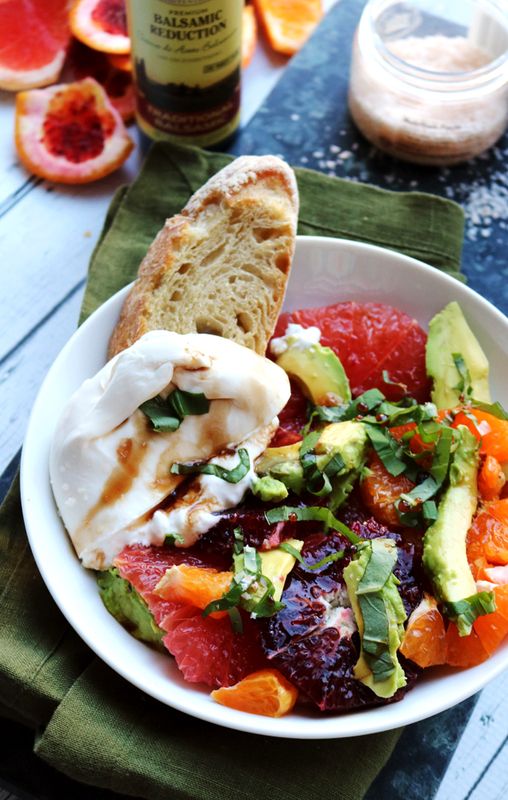 (And it also just happens to be the perfect appetizer for the BIG DAY when served along with some goat cheese!) And what a party it would be. A healthy party, to be sure…but I think we’re going to get enough unhealthy in about three days. We can sacrifice a little now…especially when “sacrifice” tastes this good. In a medium bowl, cover the beans with water by at least 1 inch and soak overnight. Drain. Saute the onions in olive oil in a large stockpot over low to medium heat until they are translucent, about 10 to 15 minutes. Add the garlic and cook over low heat for three more minutes. Add the drained white beans, rosemary, broth, and bay leaf. Cover, bring to a boil, and simmer for 30 to 40 minutes or until the beans are very soft. Remove the rosemary branch and the bay leaf. 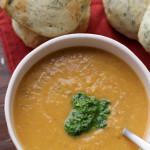 Use an immersion blender to puree the soup. Reheat and add salt and pepper to taste. Combine the chopped figs and 1/3 cup water in a heavy medium saucepan. Cook over medium-high heat until liquid evaporates and figs are soft, about 7 minutes. Transfer to a medium bowl. Mix in olives, olive oil, vinegar, capers, rosemary and walnuts. Season to taste with salt and pepper. I am submitting this to Deb of Kahakai Kitchen for Souper Sundays and also to Chaya of My Sweet and Savory for Meatless Mondays! Congratulations on completing all your races!! Your soup looks delicious too 😉 Perfect for celebrating! So happy to hear that you have finished all of your running requirements. I hate to think of you running in pain, though. Take care of yourself!! In the meantime, that tapenade is really calling to me. 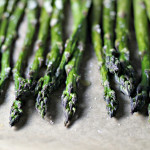 What a FABULOUS thing to put in a creamy soup. That’s a stunning combination of flavours! Now take it easy so that 6 week recovery doesn’t stretch to 6 months. I would love this soup like right now even though it’s 7:30 in the morning…looks awesome! And I love the brussels sprouts on the side too 🙂 Congrats on all the races and yay for the 2012 NYC marathon!!! What a gorgeous soup. Love the tapenade. Id like to wish everyone whose blog that i visit a happy Thanksgiving to you and your family’s, and thank you for being a reader to mine. Richard from Amish Stories. 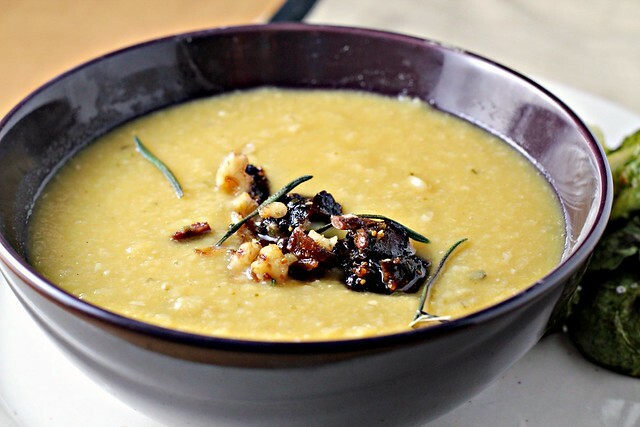 I love the flavor of the walnuts in the soup and rosemary! It looks divine and perfect for the cold day that we NEVER seem to get here in Houston! LOL! That soup looks so fabulous! And the tapenade just takes it over the top. I’ll be thinking of you and your cooking this week — I know it can be a challenge satisfying everyone in your family! Hope this helps you de-stress. I love this soup but I love even more that you qualify for NYC marathon next year! SO exciting!! That soup looks amazing. And fig-walnut tapenade? And hooray for you being able to run the marathon! It goes right by our building. I’ll be outside next year (probably eating an egg and cheese sandwich and sipping a mimosa out of a thermos…) cheering you on! What a great looking soup and very nice photo. You had me at rosemary and white bean … but then that tepanade! Fabulous. Soup looks delicious and this is the first time I am coming across a fig tapenade…:) Lovely combo though.. I have never tried anything like this, never seen on any restaurant menu. Unique and appealing. I thought it was accepted that vodka is the answer to all of life’s most rhetorical and profound problems. I wish I had have seen this recipe over the weekend as I would have loved to have a bug vat of this soyup cooking. Soup with Vodka – sounds like a plan to me. You know this appeals to me heaps! Now I want cooler weather!! I think vodka and this soup would solve most of my problems! Man, I love soup. And I love white beans. And 4 cups of onion? Yes please. You’re not yellow anymore! Yes, I notice such things. Also? You forgot soup when you’re sick. Or is that just chicken soup? Believe it or not, I wasn’t much of a soup gal until recently. Now I can’t seem to make it enough. And THIS sounds wonderful. I do love the cannellini bean. Love the soup, but please, please, please, do NOT try to run through injury. I did that and it’s the main reason my marathon days are over. I was stubborn, and I paid a very steep price for it. Yay for finishing the races to qualify. Such hard work! That soup looks great. I am actually looking for a soup to serve for Christmas dinner. I am going to add this one to the list. This sounds fab! I just bought some dried figs from Trader Joe’s yesterday, not sure what to do with them. Now I just need the olives and capers, maybe I’ll be good and walk to the store to get them? I think I am going to make your soup for lunch today or tomorrow. I really love soup this time of year,served with a fall harvest type salad. Yum!! That tapenade is truly something special. I love that you decided to top the soup with it. Not being much of a soup person, I always look to the extras/toppings for added textures and excitement. This looks exciting to me. What an awesome idea to put that tapenade on top! 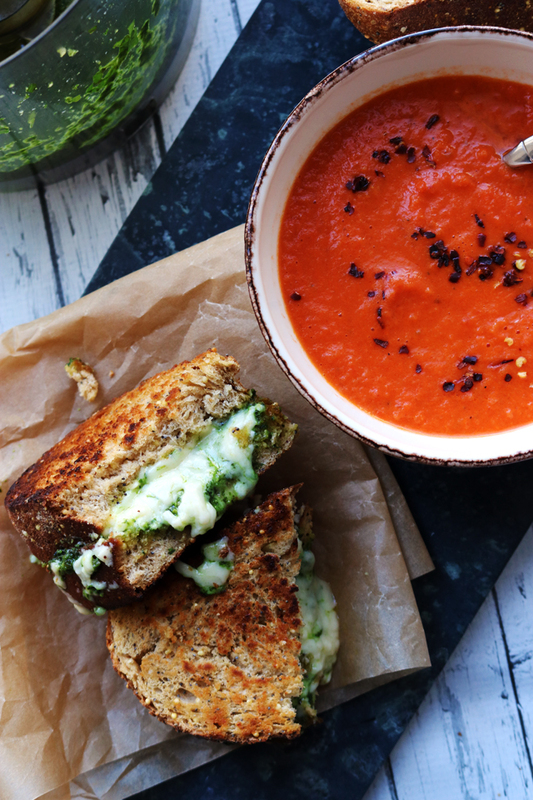 I love the look of it, as well as the soup – it seems like the perfect texture. Yum. This soup sounds amazing and would certainly be the answer to any question…especially with that delectable fig “icing”. Good luck with the future running Joanne! I am so happy for you that you are healing. Soup sounds cozy. Congrats on the marathon! I hope you will win the trip to Greece Joanne. 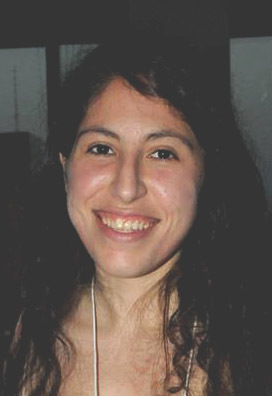 This will give me the chance to meet you if you visit Athens and if you would like to meet with me as well! The soup is terrific. It is quite cold here and there is nothing more comforting and soothing than a nice, steaming bowl of soup! I love bean soup, but I’d agree with the fig tapenade being the icing. I love the balancing act between the sweetness of the figs and the sour from the capers and vinegar and the salty of the olives. Mmmm! The tapenade is drawing me in. I love your soup recipes, and after the smashing success of the tomato/cashew Indian-style soup you posted, I think this one will be a good follow-up. Please always keep on blogging. I’m developing an addiction to your stuff. I didn’t know you could get into a race like that by completing events, that’s a great way to get in. Sorry you are in pain though! I’m signing up to do a half marathon at U of I in Champaign, IL April 28th. I just started running again this past weekend and it felt pretty good! This soup sounds delicious, and I think I could just eat a bowl of the tapenade by itself! I’ve never had figs in soup-what a great idea! Fig and walnut tapenade!!! Wow!! Looks really amazing. This soup and tapenade look fantastic – I have issues with skinny jeans, so will try and give this a go 😉 Also, way to go with the running thumbs up; hope the recovery is progressing well. The “Feeling like skinny jeans are just too much for you to handle?” really stuck out to me…I need a few more years to go until the vodka, for now, I’m just going to have to deal with my meltdowns. Maybe not though…a bowl of soup like this, could definitely help. The soup sounds delicious. The tapenade sounds delicious. 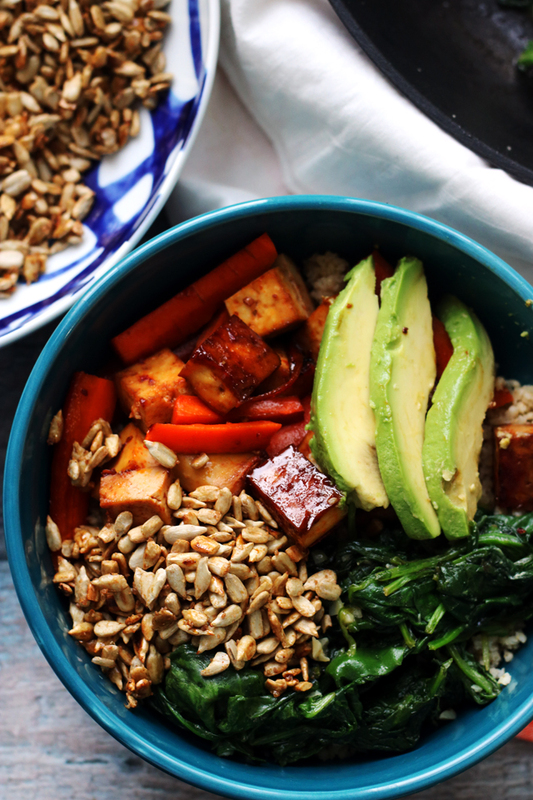 This whole dish is just pure awesomeness. Brava! And in case I don’t get the chance to stop by before Thanksgiving, I hope you and your family have an incredible holiday! Sounds super comforting and love how the soup is full of protein. Those perfect little Brussels sprouts on the side are frosting on the cake! I like the combination of ingredients you have used here – seems really interesting….esp the fig and walnut tapenade with the soup. 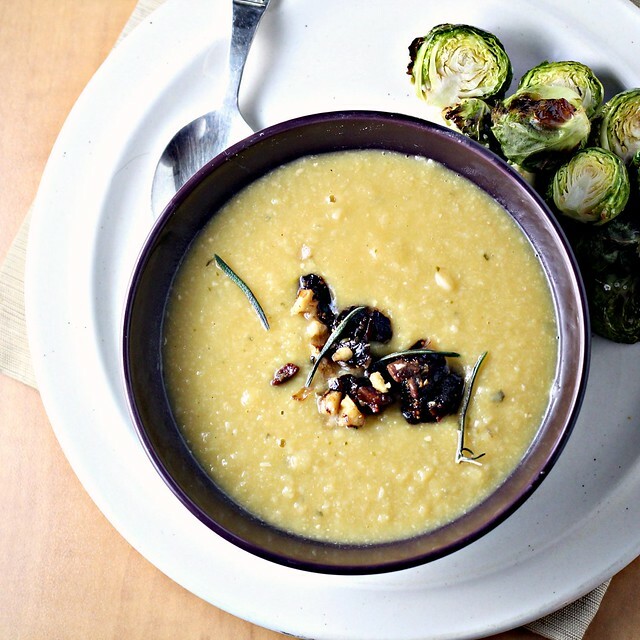 Figs and olives sound like a very interesting combination – also, the soup look lovely. The brussels sprouts on the side put this over the top! I love your description of soup and how it plays a role in our everyday life. Thank you for sharing this recipe, it sounds wonderful. I want to consume all of that tapenade. And yay for single digit weeks until you can run again! I want to put that tapenade on eggs! Fig tapenade w/ Ina’s white bean soup? I love Dave Lebovitz’s version of fig tapenade, and what a genius idea to garnish the soup with it! I love Ina’s white bean soup, and this brings it over the top. I am stealing the idea! 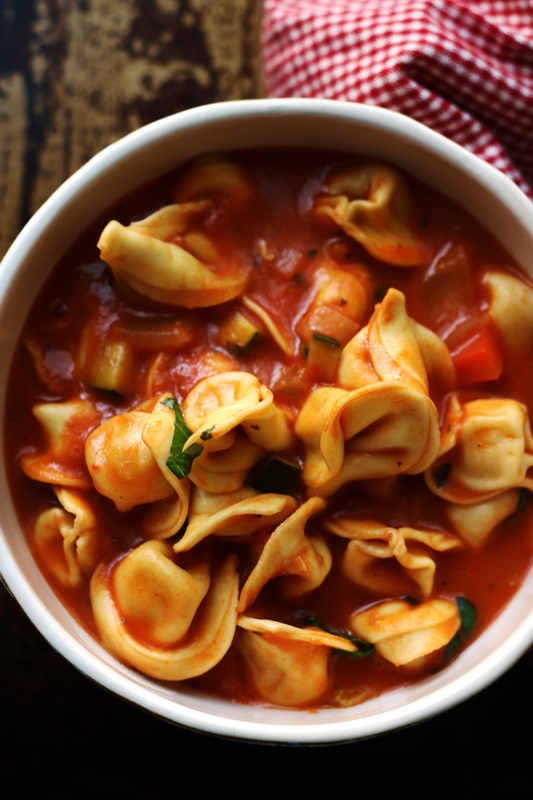 Your soup looks good for whatever ails you! I love creamy white beans. And I could spoon up the tapenade as is! Yay for the marathon! 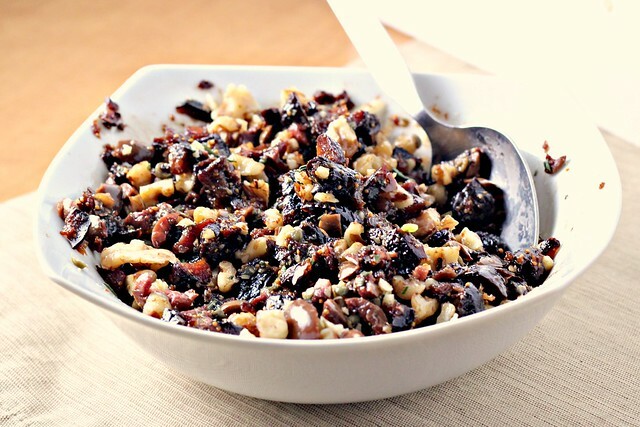 I was really scared that the fig tapenade was going to call for fresh figs and then I was preparing to slap you for posting a fresh fig recipe post-season. Phew. Good thing that’s been avoided. This sounds amazing! Oh this soup looks just awesome!! Hope that you have a wonderfully blessed Thanksgiving!! Soup always makes me feel better! Loving the tapenade AND the soup. YUM! You inspired me Joanne, I’m making soup today! Obviously you are determined. Congrats on completing all the races, especially since you’ve not exactly been in top form. The soup looks delicious. i am on such a rosemary kick right now. this sounds so, so good. I am soooo going to be using this Tapenade on all sorts of stuff over the holidays!!! The soup’s awesome too! 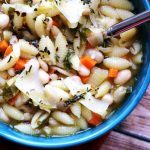 I really don’t make enough recipes with white beans! This soup looks fantastic and so does the tapenade. Oh your soup sounds like I want some right now. Beautiful combination of flavors to cheer anyone’s spirits. 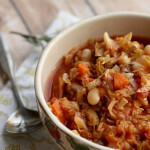 This soup looks so yummy and hearty and healthy. 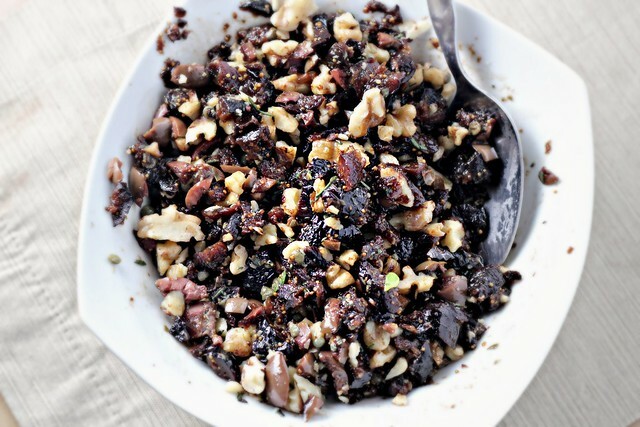 I love the idea of fig tapenade! The figs gave me pause. Isn’t part of the fun of food, nowadays, the creative pairings we do? Forget the psych consult….soup with trileptal and seroquel. Oh my God this looks delicious! My Nana and I are looking at your blog, and she’s loving it too! sounds delicious – in fact it sounds so good that you should just get entry to the NY marathon just based on this soup – seriously! First, congratulations again on the NYC marathon 🙂 I’m so excited for you and happy you’ll be able to run again soon! You should be really proud of participating in that last race — I don’t know if I would have had the courage to. Congrats on the marathon–will continue to think good, healing thoughts. 😉 The soup looks fabulous but the topping really makes it. What a great pairing. Thanks for sharing it with Souper Sundays. I think soup is one of the most difficult foods to photograph and you have done beautiful job here. I hope you guys had a wonderful Thanksgiving! Sounds heavenly, and I’m with Dana, soup is so hard to photograph but your pictures are stunning. Can’t wait to try this recipe, it sounds perfect for the cold winter months. Figs to the rescue of my too tart tapenade! !Brilliant idea.Thank you! OH, and Grace, I”ve made sticky pudding with figs, so pretty figgy and scrumptious, too.